Tickets have gone on sale for the production of Miss Saigon I've been working on. It's being produced by Ignatians, the same musical company who did the extraordinary production of Les Miserables that I was lucky to be a part of last year. Let me say that Miss Saigon is a pretty rare production to be done at any level - to the best of my knowledge, it hasn't been performed in Brisbane since the QPAC production in 2007. But after the huge success of Les Mis last year, there was nowhere to go but up - this show is huge. It's been an amazing rehearsal and production process so far, getting sneak peeks at the design, the costumes, the choreography. It's going to blow Les Mis out of the barricade. This internationally acclaimed and long running musical debuted on the West End in London in1989, where it played until 1999, transferring to Broadway in 1991 where it continues its run and is currently the 10th longest running musical of all time. It is written by the powerhouse team of Claude-Michel Schönberg and Alain Boublil, (the writers of Les Misérables) with lyrics by Boublil and Richard Maltby, Jr. The story is based on Puccini's classic opera Madama Butterfly, with the narrative transferred to Saigon in April 1975, at the climax of the Vietnam War, and Bangkok three years later. Chris, a troubled American G.I., and Kim, an orphaned Vietnamese woman, find comfort in each other as the Vietnam War spirals out of control. Their few days of love, which are cut short with the Fall of Saigon, set into motion a life-and-death chain of events. It's steamy, epic and epically steamy. It's unofficially known as "the chopper musical" because of the famous scene which replicates the fall of Saigon and evacuation of the Americans by helicopter. On top of that, there's spectacular scenes in the seedy nightclubs of Saigon, on the streets of Bangkok and the streets of Ho Chi Minh City after the reunification. 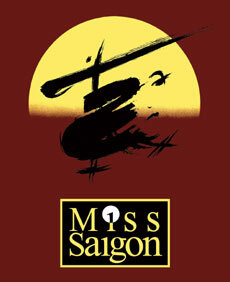 If you loved Les Mis, there's a good chance you're gonna love Miss Saigon as well. I'll post promo pics when they're made available to me, but I wanted to get the word out there now - don't miss out on the rare opportunity to see Miss Saigon live. It's on for 15 shows only in the Schonell Theatre at the University of Queensland from September 23rd to October 15th. Tickets are available through the Ignatians website - http://www.ignatians.com.au - or by phoning 07 3371 2751.